Not a big fan of sinkers as they cost a lot. Not that sinkers are expensive (usually nothing but a ball of lead with a hole in them), but that they are the single most consistent source of snags. They are usually the first item on the line after the snap/swivel, so when it snags, you lose your hook, line, and sinker when the line breaks. There are times when they are a necessity, particularly with strong tides or currents that just take your lure away, instead of keeping it where you wanted it. I recommend 1/4 - 2oz as a rule. 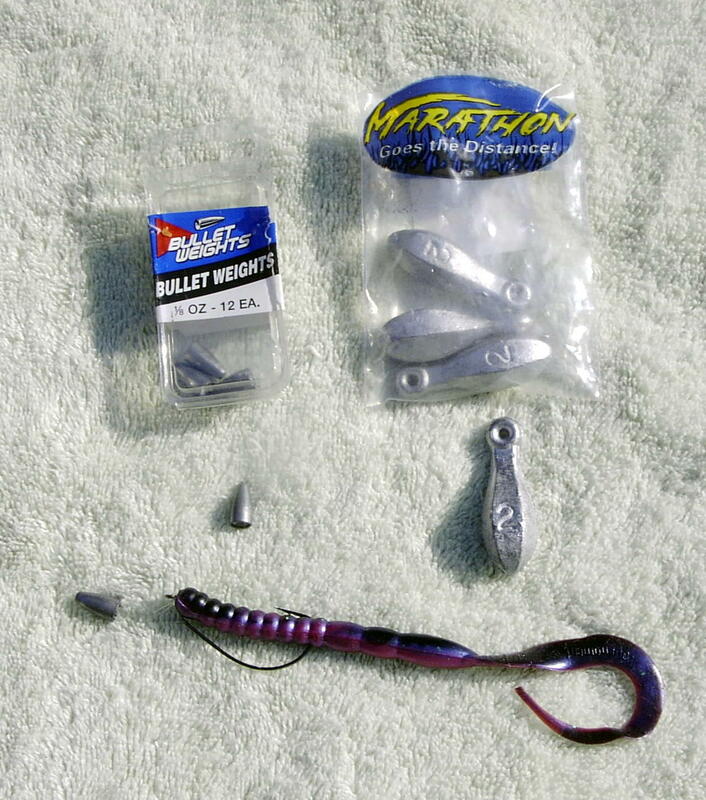 1/4 & 1/2 oz bullet nose for plastics, 1/4 & 1/2 oz bass weight for tube baits, and 2oz for strong currents or wanting to cast further than the lure itself will carry. I use 2oz almost exclusively for catfishing, as the secret to catfishing is to let the catfish find the lure, rather than the other way around. Keeping the lure in place is the object. No such thing as a snag-free weight; Lindy, Bottom Bouncers - I've used them all - and they are expensive. Not the intelligent thing to do, but it is so seductively simple, is to poke a loop of line through the eye of the sinker and merely pass the loop around the body. It normally won't slip (with braid), and should be easy to undo - if you have a sharp instrument, like an awl - but not usually. I wish I could get into the habit of tying really cheap, no-strength mono to them so I don't end up snagging everything.